Why it’s the albino raccoon and the new buddy Arrow. I have to call her Arrow with the big smile. Arrow is the only creature that comes around that will eat the cats canned food. I’m very amazed at all the creatures that get along with each other. the albino raccoon is a female with little pink hands. She’s not full grown yet like her mother who still comes by with her. It’s nice seeing them together. There was five babies and mom that used to come around together last summer and fall. The possum has really unique hands and feet. They are all like opposing thumbs or multi jointed fingers. I haven’t had that many hours of watching the possum. I think it’s wonderful that it stops by. I’d like to see baby possums one day. the possum seems really calm and peaceful. I was bringing the skunks and raccoons a cheesy treat and tossed one to the possum. It seem to like the cheesy treat. Everyone seems to like the cats food. I know they like the more expensive cat food and will eat that first over the cheap stuff. I’m amazed at how the skunks get along with everyone. They might stomp their feet if someone gets too close. They don’t spray every thing or everyone. the most you might get from a skunk is them stomping their feet at you. I’ve noticed when they see me they come over to see me to get a pet or scratch. I find them to be all very interesting. They like to be treated nicely and then they will treat you nicely. I really find the foxes as very intelligent creatures. 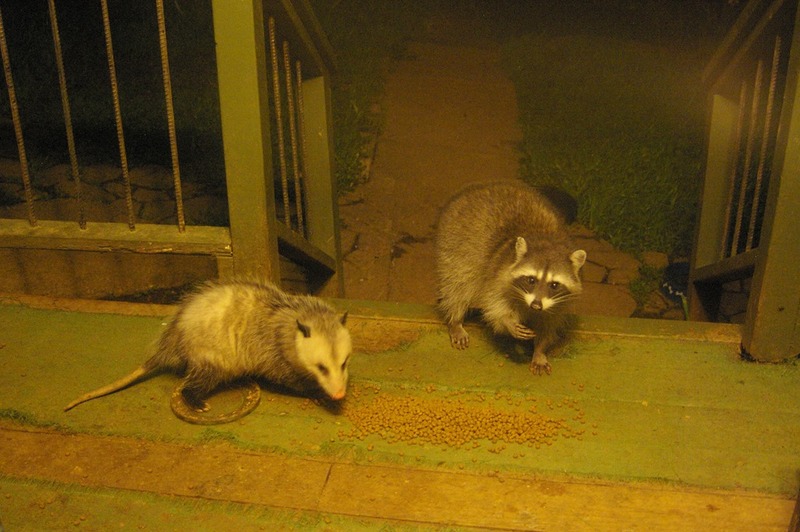 They get along with the cats and raccoons. The skunks will stomp their feet at the foxes but that’s about it. I think the skunks are spooked at how fast the foxes dart around them. This entry was posted in Nature and tagged albino raccoon, arrow, possum, raccoon. Bookmark the permalink.